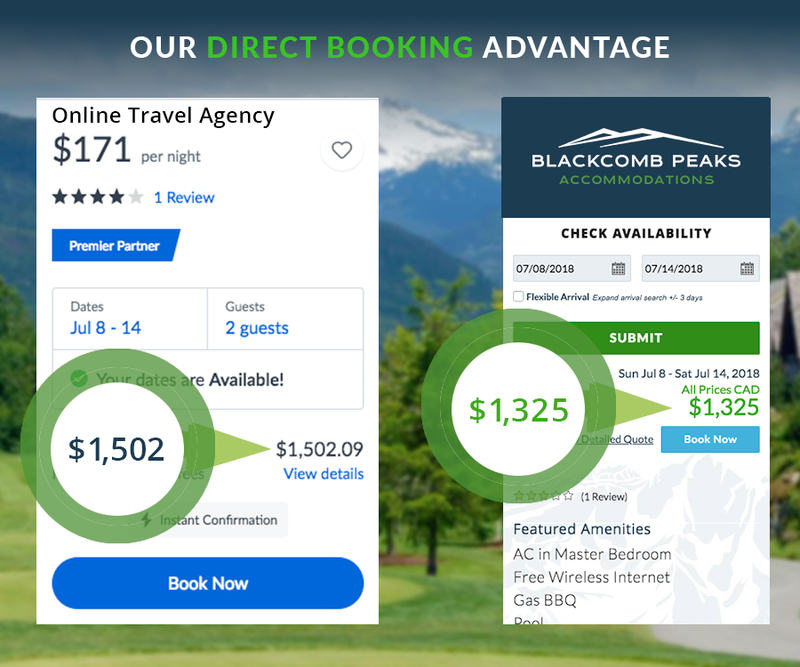 While you may find Blackcomb Peaks units on popular online travel sites, those sites often charge guest fees and booking fees in excess of 15% on top of the nighly rate. So while it may seem like their prices are lower than what you'll find elsewhere, the hidden fees will actually make it more expensive to book on those travel sites. You will always get the lowest rate, guaranteed, when you book directly on Blackcombpeaks.com or over the phone with one of our wonderful reservationists. The graphic below is an actual example of the price difference for one of our properties compared to one of the online travel site. Online travel site on the left, Blackcomb Peaks on the right. In addition to saving money, there are several other reasons for booking with Blackcomb Peaks. Our rates on our website are always accurate, availability is up to the minute, and you can book securely at any time of the day. If you need more info about the property you are interested in, you can always call our reservation team during business hours, or use our online chat if we are available. Booking directly guarantees superior service before and during your stay in Whistler. Many of the online travel websites do not share the guest's email address with us, so if there is any reason to contact you before your stay, we will not be able to. When you book directly with Blackcomb Peaks, we send over important information prior to your site, such as check-in instructions, tips on parking, what to do in Whistler, and more. We also pride ourselves on helping guests plan the best vacation possible, by offering personal recommendations from our local team before or during your stay, and making sure the unit has everything you need. We've even been known to bring over one of our personal blenders to a guest in need!